Skyfire is designed for the outdoor photographer who wants to capture images in the best possible light - people who appreciate knowing in advance if the sunrise will be worth getting up for at 5 am on a chilly winter morning. Skyfire is another tool in the photographer's kit which helps plan shoots ahead of time, leading to better images. Galen Rowell said that all photographs are made from three parts: skill, equipment, and environment. Skyfire lets you master the one element that has always been impossible to predict: the environment. What's the recipe for great skies? Time of day, plus cloud cover, plus a clear horizon equals color-filled skies. Time of day means sunrise/sunset, but which day will have cloud cover at those times? Cloud cover, yes but at what altitude, quality and volume? Clear sky at the horizon, but in which direction and just how clear? 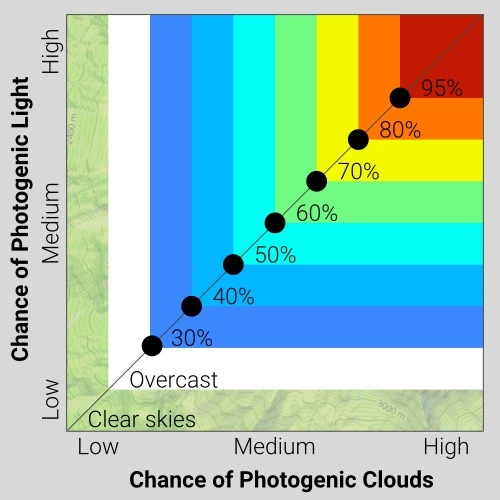 Using national and regional weather forecasts, Skyfire employs complex algorithms to analyze, interpret, and generate predictions for sky color. HOW Do I READ THE FORECAST? Skyfire maps display the forecast for the area directly overhead of the map location. Skies over Boulder were in fact clear, reflecting a level of unavoidable uncertainty in cloud and weather forecasting. The red band of clouds you see is 26 miles due west from the shooting location. Remember that often, clouds are visible from many miles away. You don't need to be directly under the red area to see fiery skies. High clouds, such as those often seen in winter months, may be visible from 40 or more miles away. Where do you offer Coverage? Skyfire currently offers coverage in the continental United States, Southern Canada, and Europe. We are working to expand the service as we continue development to other areas. The Skyfire forecast is an ensemble forecast. It aggregates data from NOAA and the National Weather Service and applies its own post-processing to develop the best forecast possible. Cloud data is very difficult to predict, as it is a complex process. 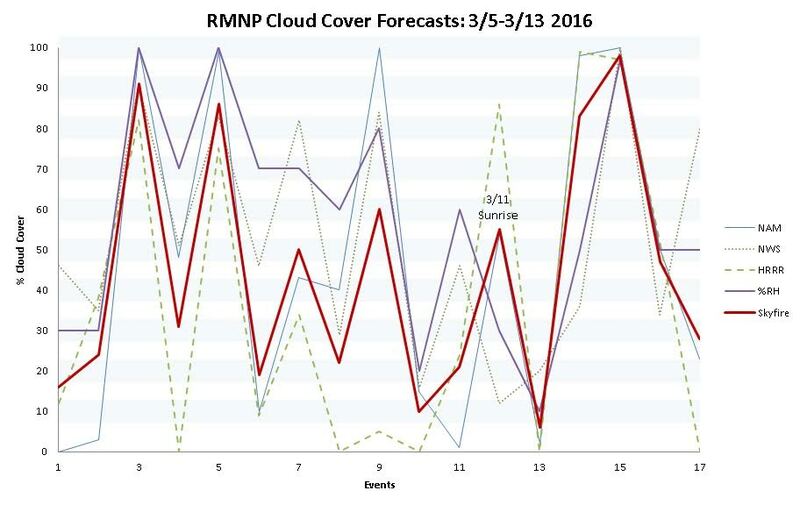 By using multiple data sources we can increase forecast accuracy. Below you see what the input/output data looks like on a typical week, with Skyfire output shown in red. Note how the various input forecasts can disagree with one another: sometimes one is forecasting clear skies and another 100% overcast. We use secondary indicators in the data to determine which is likely to be correct. With many free weather forecast services available, why subscribe to Skyfire? Our algorithm allows for terrain influences, 'over the horizon' effects, and multiple cloud level effects. Terrain comes into effect mostly with low clouds. If the mountains are higher than the clouds we consider the light blocked. 'Over the horizon' effects: we look at what clouds may be 30-150 miles away and how they influence the clouds at the observer's location. A solid bank of mid-level clouds 60 mi away could kill a sunset at your position, for example. We're constantly working on improvements to the patent pending Skyfire algorithm. Your subscription helps us continue to develop! © 2018-2019 Skyfire Services LLC. Privacy.